Acupuncture is a method of healing that utilizes fine needles. These needles are inserted into points to regulate the body’s Qi (vital energy) in the channels & collaterals. It is an ancient medical art, which started and has been practiced in China for over 2000 years, and it still remains the primary source of medical treatment in China. Research has confirmed that acupuncture not only provides pain relief but also enables the body to use its own innate healing power in the treatment of many diseases. Acupuncture needles are sterilized, single use and disposable. Most patients say acupuncture is painless. If your practitioner has obtained the correct stimulus, you should feel relaxed during treatment. Acupuncture is based on Traditional Chinese Medicine (TCM) theory of the free flow of Qi and blood through meridians or channels that cover the body, similar to the nervous system or blood vessels. 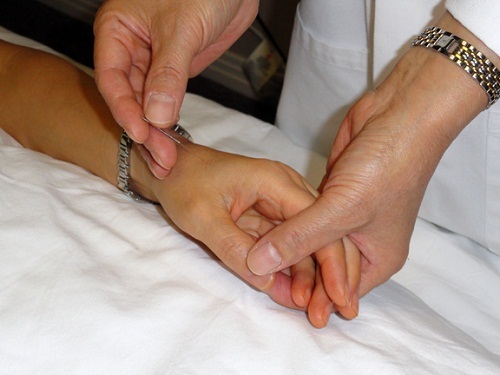 An acupuncturist will observe the patients symptoms and signs of disease and will be able to locate the points on the body that will unblock the meridian and allow the free flow of Qi to continue. In this way, acupuncture regulates and restores the balance of the body. The modern biomedical explanation is that the needles stimulate the points to bring the signals to the brain through peripheral nerves, then the brain regulates the body’s function through the body’s nervous system and immune system, etc. It is likened to hitting different keys on the keyboard to make the computer work for you. What is a treatment procedure? Plan one and a half hours for each acupuncture treatment, and 30 minutes for an herbal consultation. If you are a new patient, please come 15 minutes early to fill out paperwork. Eating approximately one hour before your acupuncture treatment is advised. What to expect in an acupuncture treatment? The practitioner will ask you questions about your general health condition, history and symptoms, feel your pulse and exam your tongue. Based on a clear diagnosis of your condition, treatment plan will be developed, which may include acupuncture, acupressure, or herbal prescriptions and life style consultation related to your disease. During an acupuncture treatment procedure, you may experience warmth, pressure, and tingling needling feelings locally or along the meridians. These sensations are normally mild and subside quickly after insertion. Most patients experience a feeling of deep relaxation; some may even fall asleep. Your practitioner will explain the nature of your problem and what treatment is recommended. The amount of treatment depends on the duration, severity, and nature of your complaint. Your practitioner will explain to you the proposed treatment and tell you what other options are available to you.